Peanut Butter Poppers. You Can’t Stop At Just One. And Yes, They Are Better Than Pringles. Remember the old Pringles ad? Once you pop…you can’t stop! Same goes for these babies. I love peanut butter. I really do. I have loved it since kindergarten, when I used to take PBnJ sandwiches to school. And when I moved back to India, I was very disappointed- as saddened and melancholy as a ten-year-old could be- to encounter the peanut butter that was available in India then. 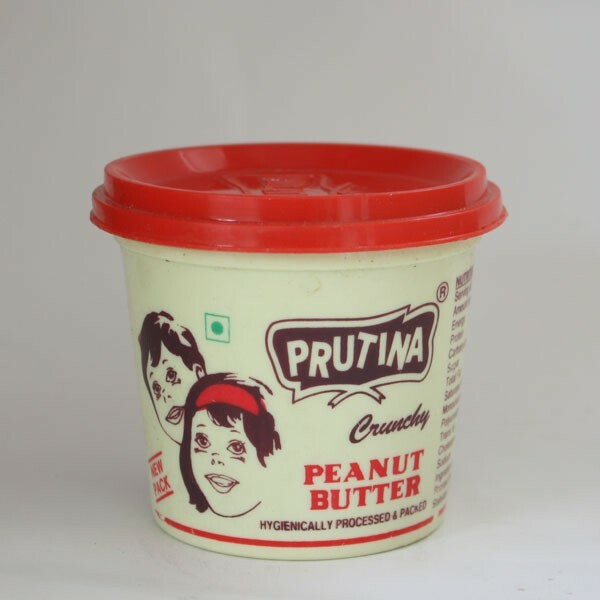 I’m talking mid-1990s, in Kerala, no imported Skippy and Jif and American Garden; no home-grown Sundrop; only one brand called Prutina and it was very upsetting indeed. In taste, texture and packaging. 90’s kids from India, remember this? I mean, this stuff was so coarse, it would break toast. As in, if I tried to spread it on toast, the bread gave away beneath my butter knife. But, since I was not a whiny kid, I just did without for years. And sparingly ate peanut butter every time someone would bring back a jar or two from abroad. Sheesh. I missed peanut butter. I really did. It was like I left behind an old friend. This recipe for quick peanut butter cookies has been doing the rounds. I found it on The Patterned Plate first, which led me to the recipe at Gluten-Free Girl, and it was so easy, there was no way I could not try it. Plus, I had a brand new cake pops pan that I had been dying to use, and this seemed perfect for it. Instead of cookies, I could make little peanut butter cookie pops!! I thought it would be fun to make these cookies into little candylike balls which you could just pop in your mouth, one after another. I actually wanted crunchy, but my grocer didn’t have crunchy. So I added some rolled oats just to give it some texture. I have so much lying around, and I am always looking for ways to use it. I am not really big on oatmeal. In a large bowl, cream sugar and peanut butter. 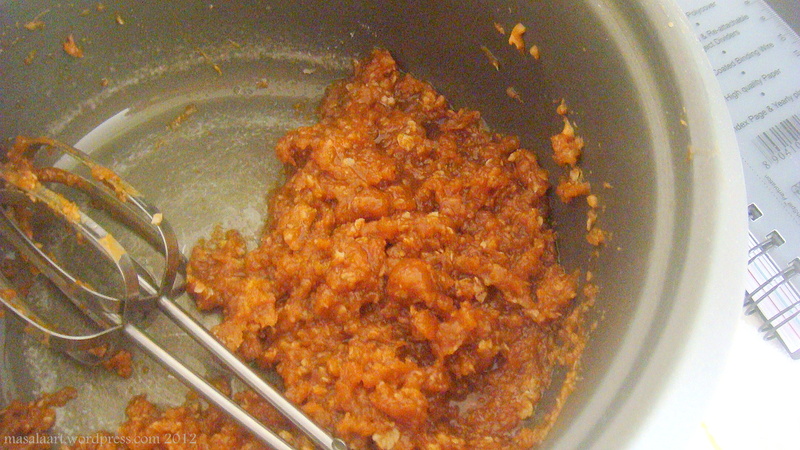 Then add in the egg and baking powder and beat some more. Add in the rolled oats and beat a little more. You will get a sticky, slicky batter. I guess this may vary depending on the brand of peanut butter you use; but I got a really slick batter. Roll into little balls with your hands, coat them in sugar, and place in a cake pop tray. Store in an airtight container. I reckon this can last for upto a week; but we finished ours in 3 days. 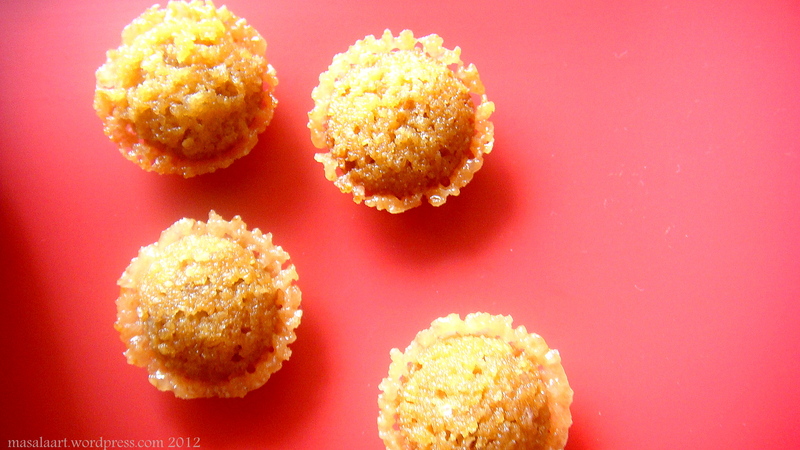 Chewy, crunchy around the edges and fast…you cannot stop at just one!! I spied this while I had 30 seconds of an internet connection at the beach and had to wait to get home to actually respond… I LOVE PEANUT BUTTER!! These are so so cute! I don’t have a fancy pop pan, but Caroline’s recipes are gorgeous and I usually can’t find the ingredients in my losery grocery to pull them off. So happy to report that I have everything I need to crank these out! That’s the great thing about these cookies/poppers- they don’t require anything out of the oridinary, they are fast, easy and can fix any sweet craving!! Haha! Yeah the smaller the candy, the more you tend to eat them…M&Ms case in point! Oooh, I love peanut butter — and these look just awesome! Thanks so much, Meg! I rarely meet people who don’t like peanut butter. It’s one of those universal favourite foods. Oh my my, what a wonderful idea! These look magical! I am quasi-obsessed with nut butters, especially peanut butter. I love this! Peanut butter is such a universal happy food. Though I need to try out some other nut butters, like almond! Oh gosh these look delicious! Peanut butter is my weakness- I always make sure I have an emergency jar in the pantry, especially as the availability of natural PB in Mumbai is so sporadic! Have you tried almond butter? It’s equally as addictive! PB Is addictive! Organic peanut butter is available at Fabindia under their oragnics label, but I have never tried it. The bad stuff is just too good to give up! But I want to try and make my own one day. I have come across almond butter and almond milk in many recipes, but I am yet to try it. I really want to though! These are delightful!!! Well done. Ha ha! Good idea. Thanks for visiting my space too. See you around. I better buy a muffin tray soon! I can’t wait to make these. You must try Skippy’s honey roasted variety! Delish! Oh I love skippy honey roasted! I know we have both shared our Prutina woes 🙂 Peanut butter is the food of yuppie gods. these look delish – as soon as I get a kitchen with an oven, i’m going through the archives on your blog and Heather’s! I LOVE peanut butter! When I first came to spain, it was the same story – couldn’t find it anywhere, I have now found it (my delight when I first saw it here was something of a sight in the middle of a supermarket full of spaniards who couldn’t understand my excitement at seeing peanut butter!) but it’s not the same as the ones back in England. I have found sunPat, but it is hugely expensive for a teeny tiny jar, so I stick to the not-as-good but still tasty ones we can get and savour the good stuff on trips home! Note to self: Rachael needs peanut butter and sweet tarts. Stat. Also this just reminded me that I am so far behind on updating my recipe page it’s not even funny! haha! I brought some proper English peanut butter home with me, so I’m good about a month…week..day?! At least I can get some peanut butter now, even if it’s not as tasty! Didn’t find the sweet tarts though! Thanks a lot, trang! Peanut butter is great, even in brownies and cake 🙂 Thanks for stopping by! Thanks so much, pueppi! 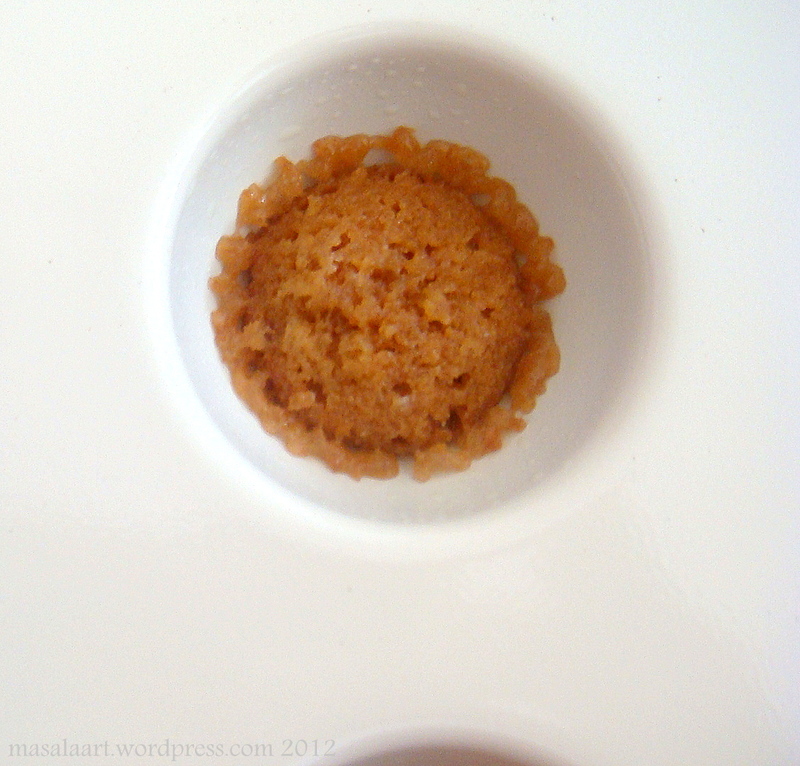 And thanks for visiting my blog…hope to see you here again soon! Haha! Love it! I came to PnB very late, but have been making up for it ever since! I love too, the lattice effect you have on yours and the addition of oats can only be a good thing. Who wants phancy when darn tooting delicious is at your fingertips! 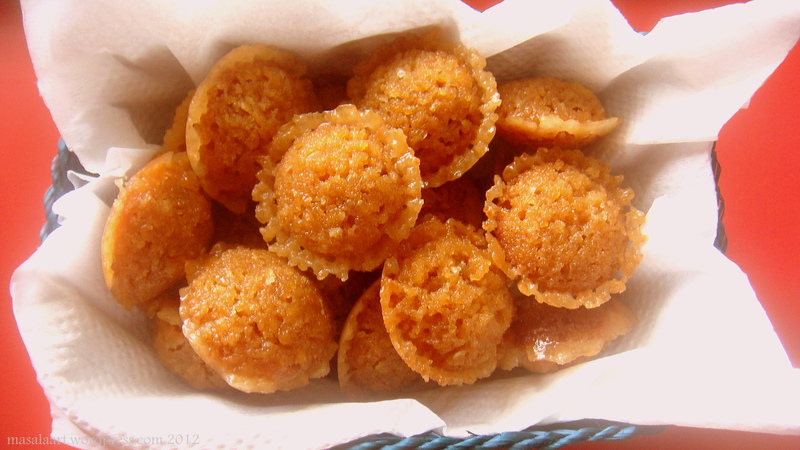 You know at first they looked like some kind of Indian sweet snacky thing, in the nature of an ada or something! Must be the colour. Yeah, it does look like an ada or very light coloured unniappam!!! But nicer than regular peanut candy you get at local bakeries. THAT’S what I was trying to get at Unniappum! A lot of the snack food, sweet and deep fried particularly, were never made at home, so I am woefully lacking in knowledge in that regard. Oh droooooooool Appam! With sweet, freshly pressed coconut milk, or with a mutton curry, or oooh with just an egg in the centre and you tear the edges to dip into it (dippy eggs Kerala style), or even, for emergencies, dipped in sugar….waaaaa, I want one! Sigh. I love appam. I have never made them; I just eat them when I go home. Mutta-appam is awesome!! And appam-mutta roast. Appam with anything is good! I am craving some too, now, after your comment. Oh well. Will settle for sambar-rice.